I can’t really say what my favorite food season might be. They each have their own delights. But, I will say Autumn ranks in the top 4. Especially when the apples really begin to show up. Malus Domestica. The fruit that brought down Adam & Eve. Ubiquitous in myth and symbolism since, well, forever. Likely the earliest fruit tree to be cultivated. I enjoy an apple on its own, with some really good cheese, or in a pie. 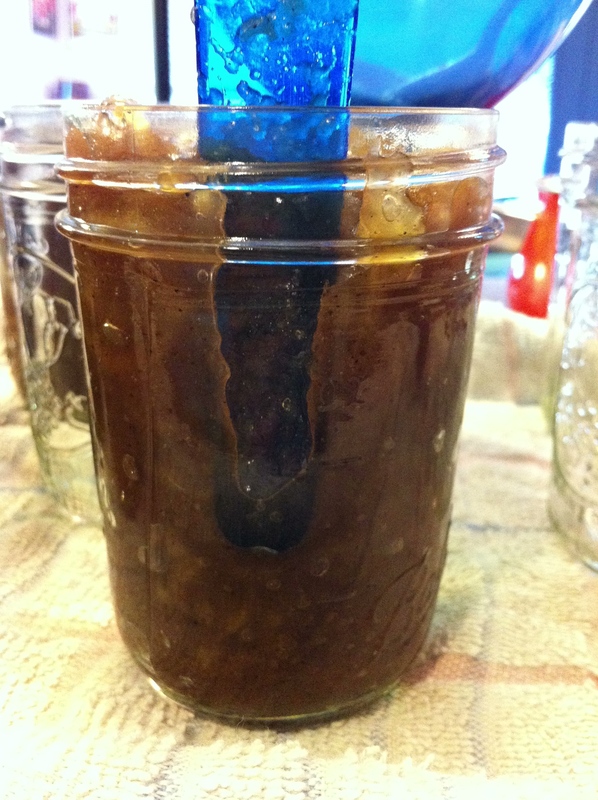 But, I have to honestly say, my new favorite way is in apple butter. Enjoying apple butter is a new thing for me. In the past the ones I’ve eaten have all been your basic commercial brands. I always found them either too sweet or too bland. 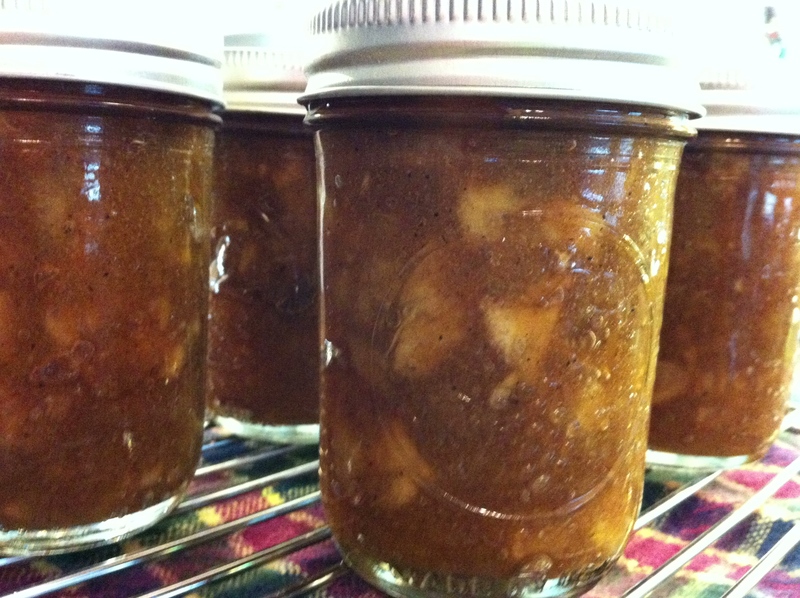 So, when I finally began to make it myself, I realized that, yes, apple butter could be good. Delicious, even. However, I have to say I can’t take full credit for this recipe. It’s an adaptation of a recipe from a wonderful book, Tart & Sweet. (Kelly Geary & Jessie Knadler. Rosedale Books, 2010). The big differences between my recipe and theirs is that: a) I use maple syrup as opposed to maple sugar. 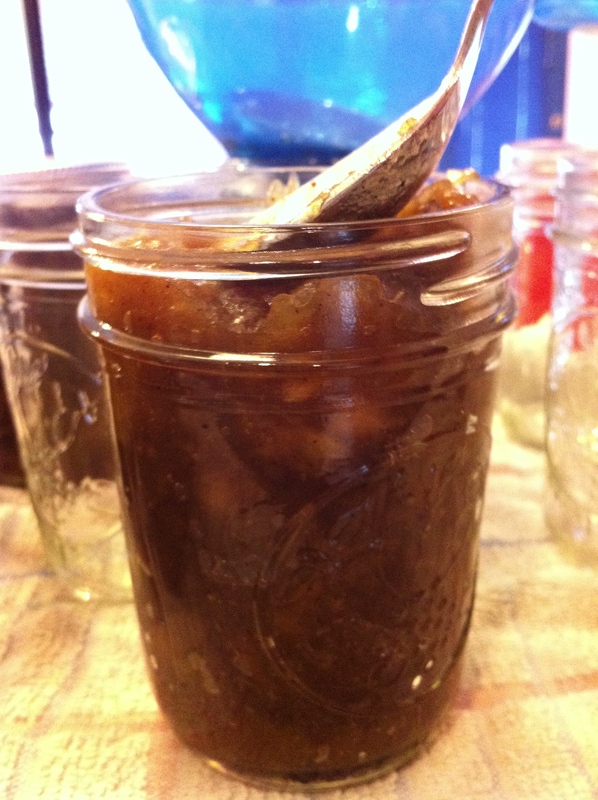 Maple sugar can be difficult to find and very expensive (generally $15 for a 6-oz jar). Maple syrup, while not cheap, is an excellent alternative that is easily found in just about any grocery store; b) I use brown sugar. 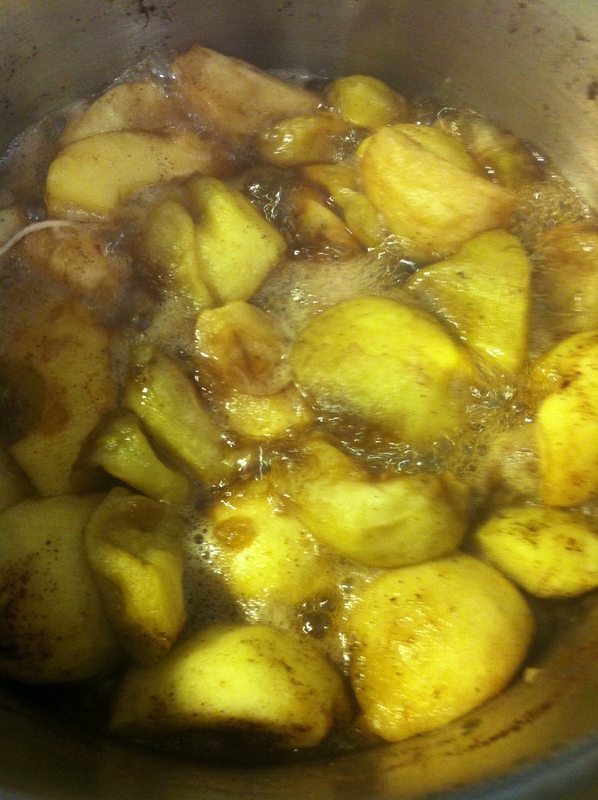 I prefer the flavor over white sugar; c) I use a larger mixture of sweet spices; and, d) I don’t puree the apples. A note: If you want/need a more thorough explanation of the how’s and why’s of making sweet preserves, please go to my August 10, 2012 post “Classic Strawberry Jam”. 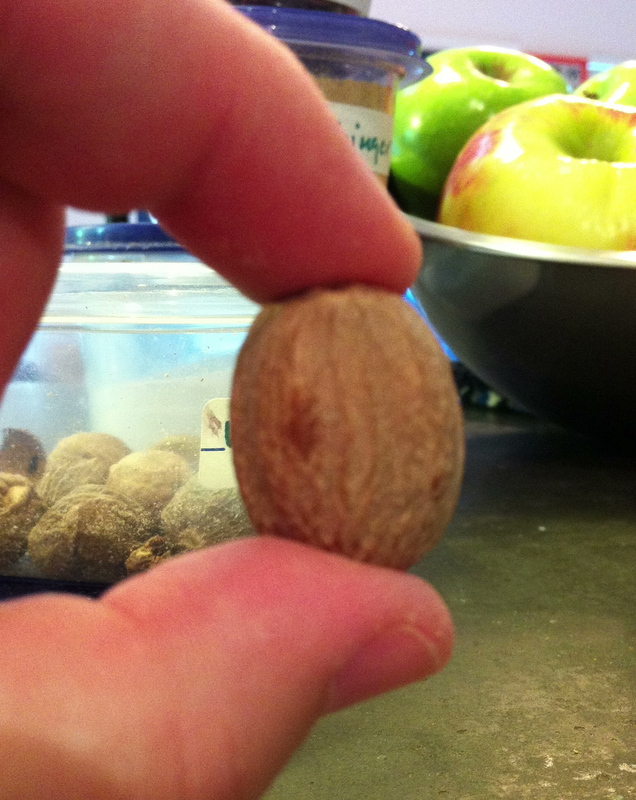 I prefer to use whole nutmeg instead of ground. The flavor is so much better. 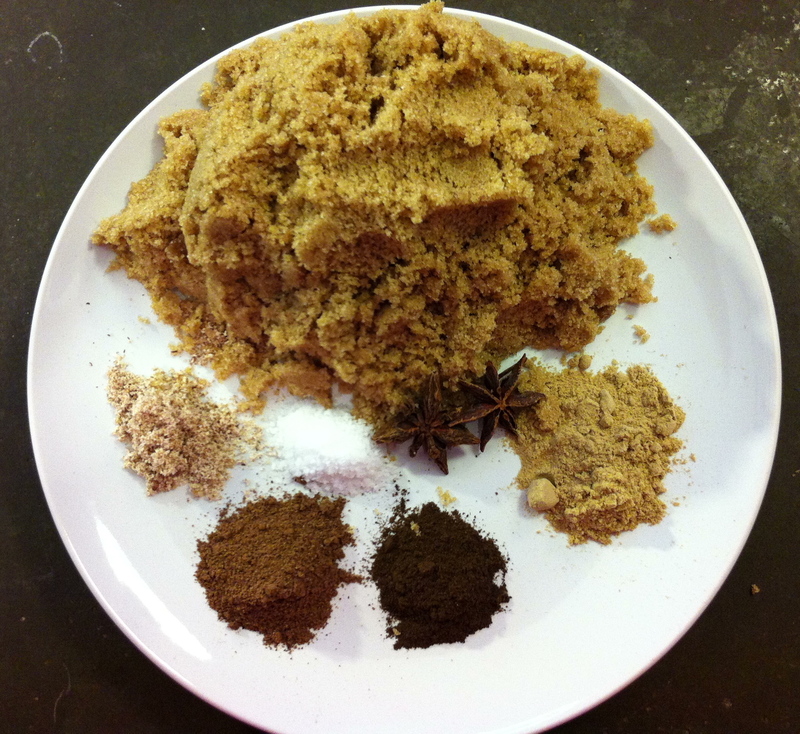 And, as with all spices, it lasts much longer in its seed/whole form. My nutmeg grater. A very small Microplane. It’s the best one I’ve ever owned. 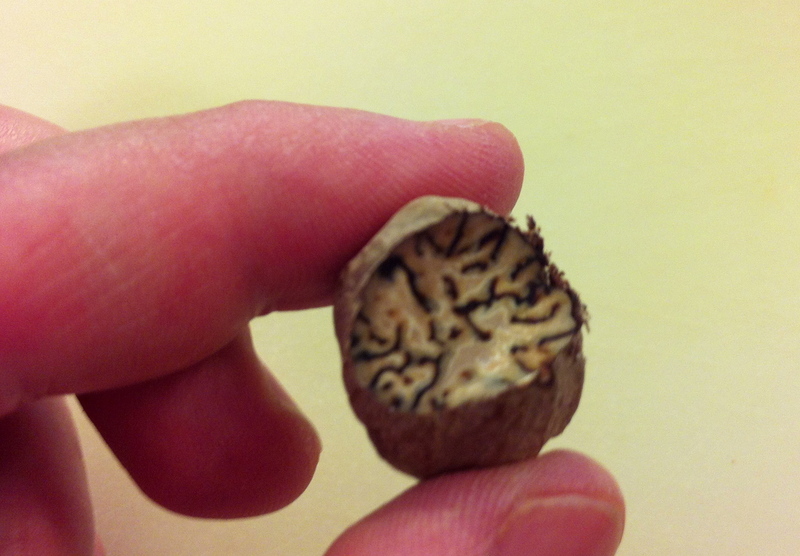 The inside of the nutmeg seed. It looks strange. But smells lovely. 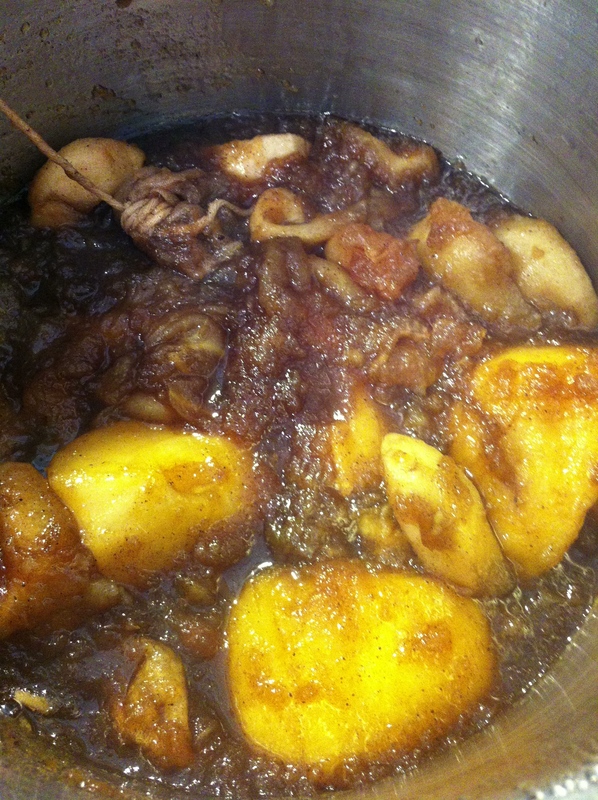 I used 3 varieties of apples in this recipe. My base apple is always Granny Smith. I love its sweet-tart taste and firm texture. 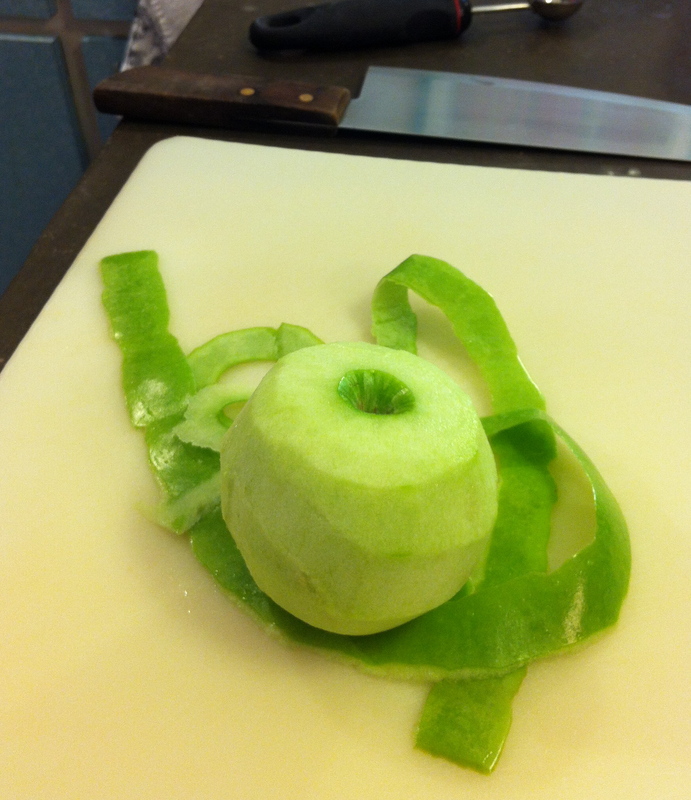 It’s generally considered one of the best cooking apples. My other 2 apples are Honeycrisp and McIntosh (use any varieties you like). I like the taste of both and it adds a depth of flavor to the final product. However, if you want to use all one variety, it’s up to you. 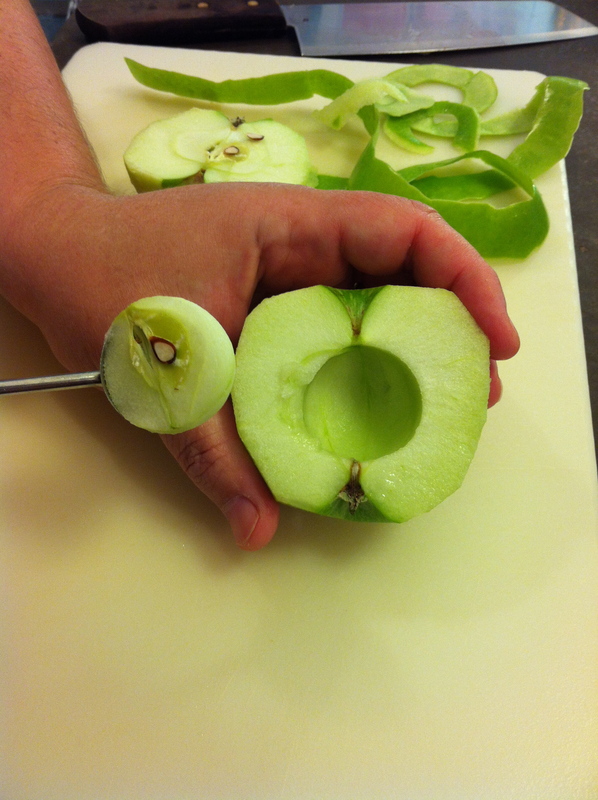 Of course, I begin the prep by peeling and coring the apples. 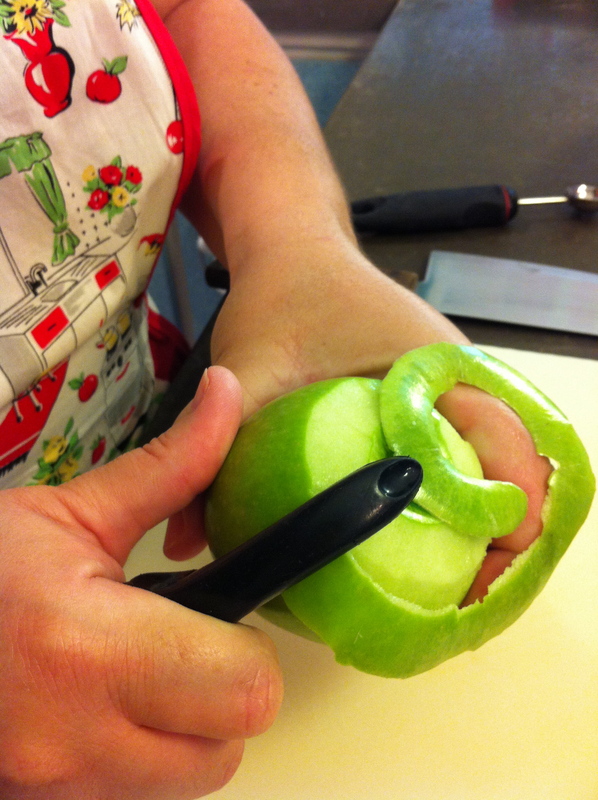 I use a vegetable peeler for the apples. 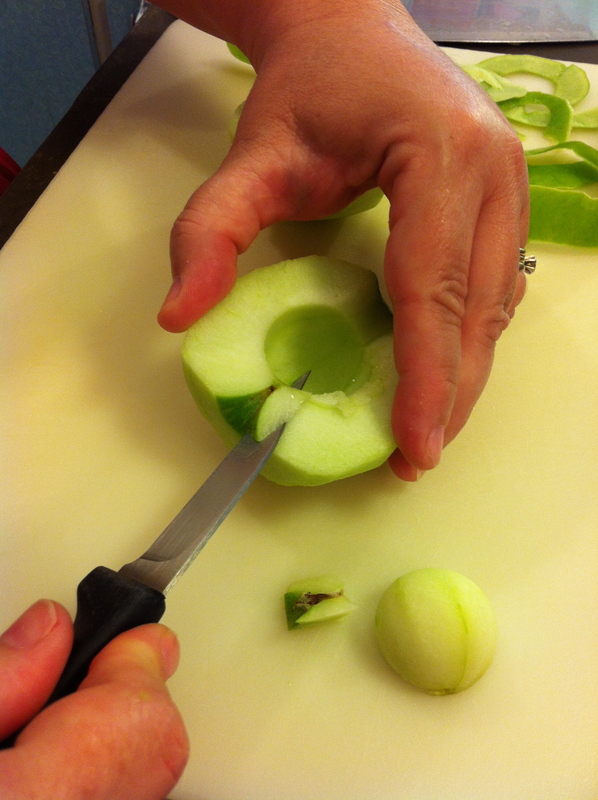 I know some who use a paring knife to peel apples, but I’ve never mastered that technique. I also use a melon baller for coring. 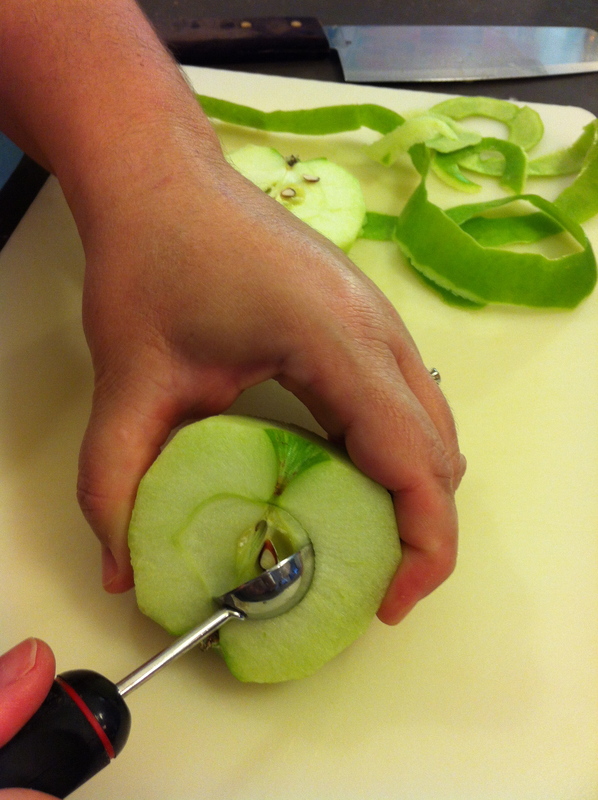 I find the tube-style corers don’t actually core the apple, rip them up, and are rather useless in general. 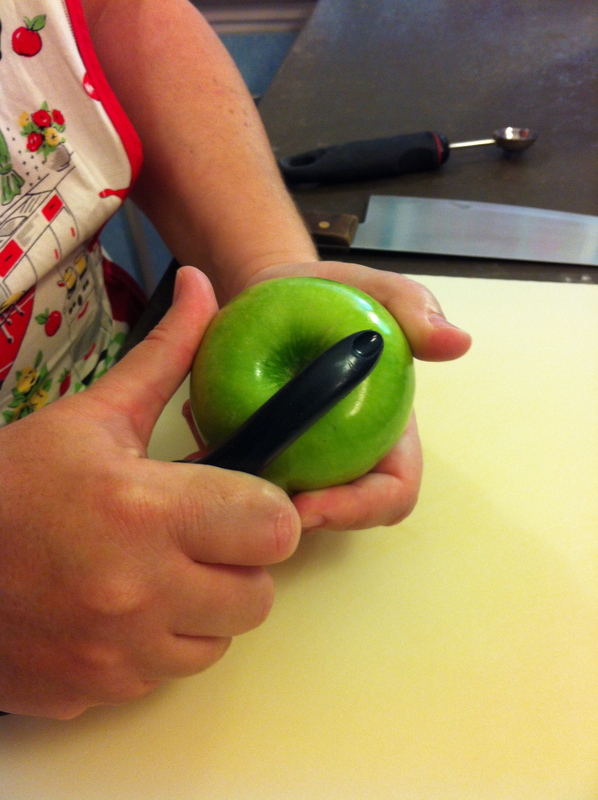 Be sure you have a sharp peeler or paring knife. You want to take off the peel, not rip up the apple. 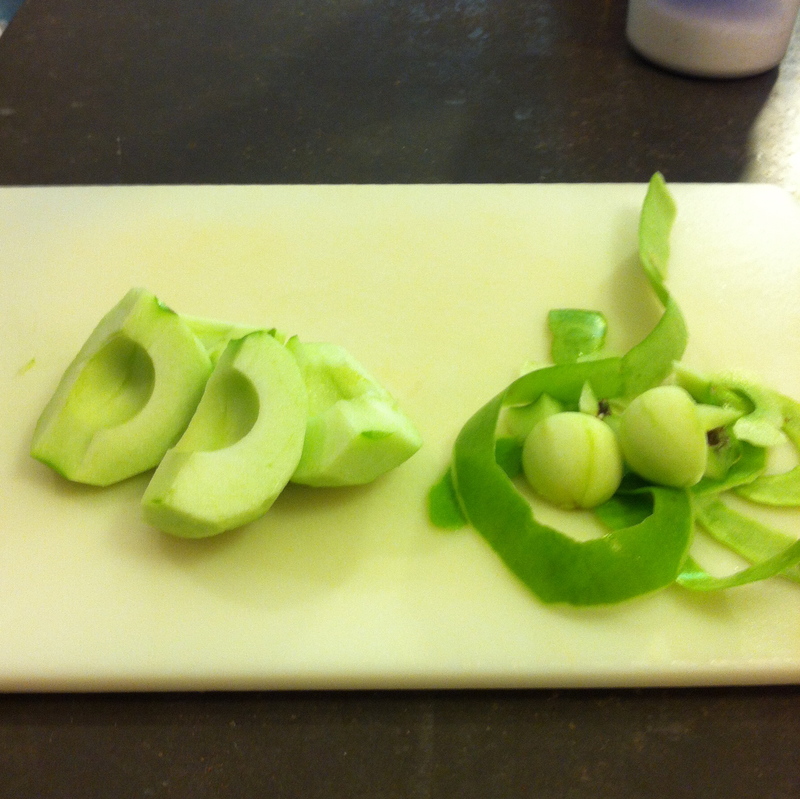 Also, a dull peeler or knife will slip and you could get a rather nasty cut. Not fun. Coring the apple. Note the use of the melon baller. Cutting out the stem and blossom ends. Cleaned and ready to go. Now, just do that another dozen or so times. 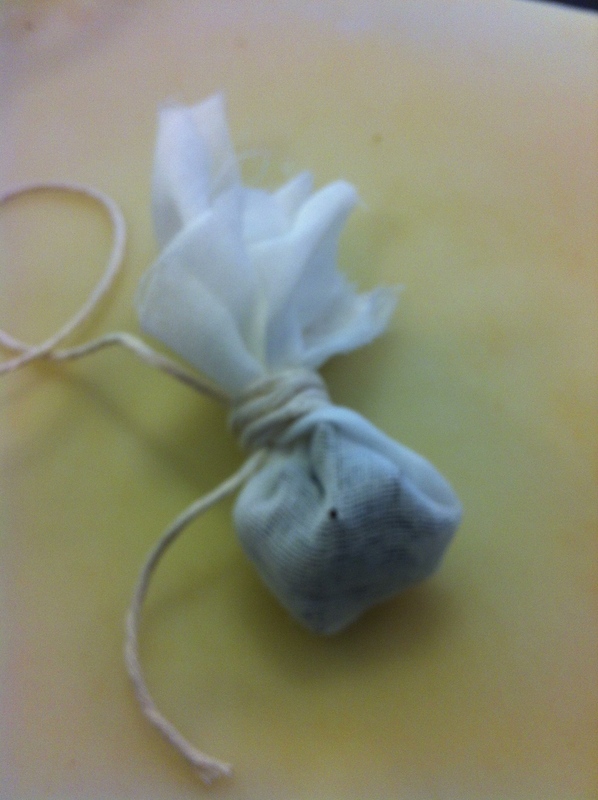 If you are using star anise, you want to wrap it in a bit of cheesecloth before you put it in with the apples. I learned this the hard way. 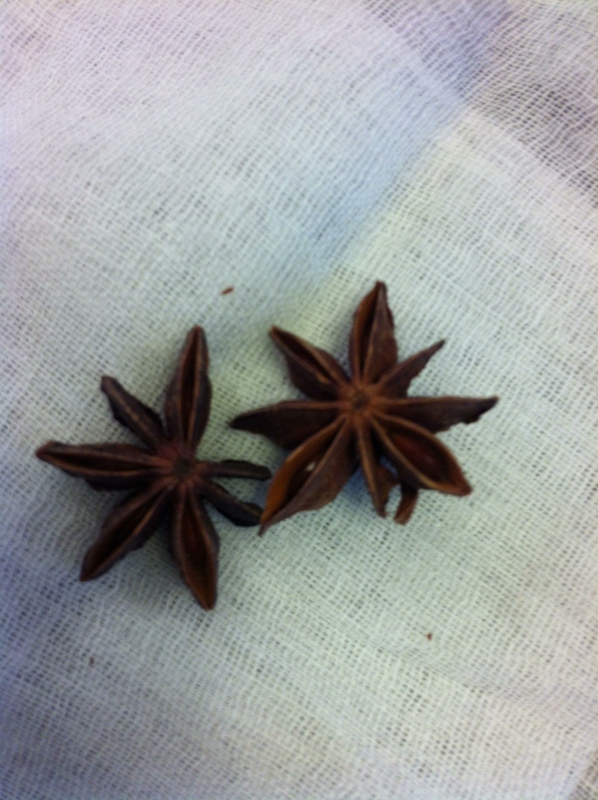 The star anise can break up during cooking and stirring. And, if you don’t get out all the pieces, someone will get a rather unpleasant surprise. 1. 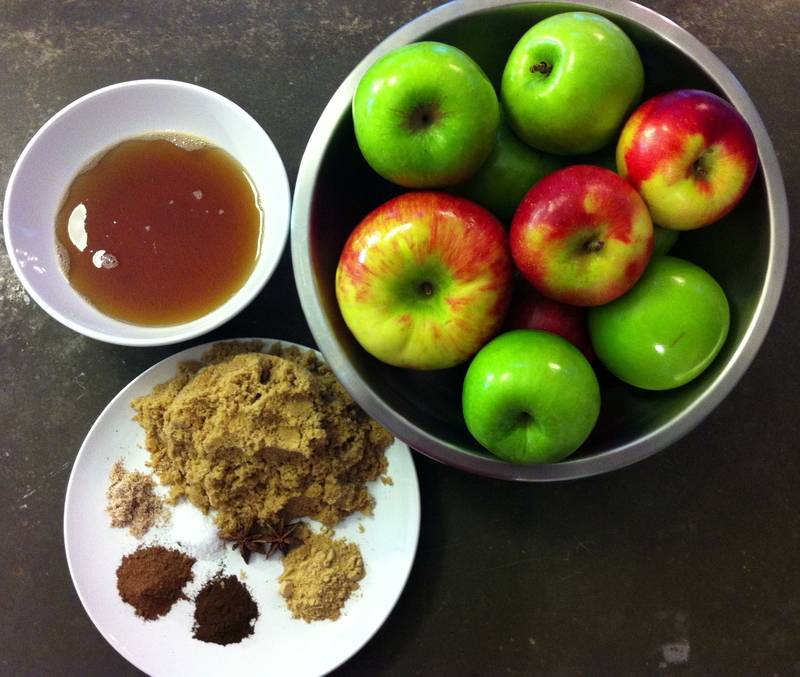 Place the apples, syrup. 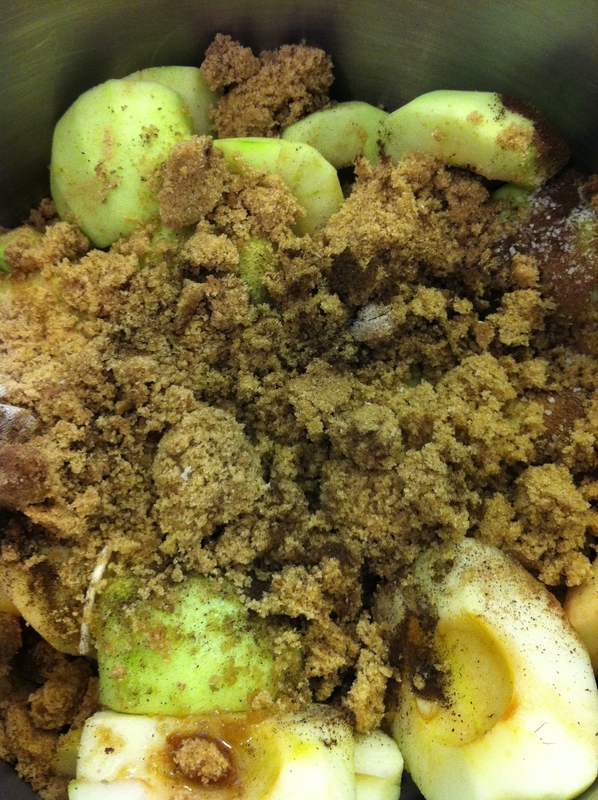 sugar, salt, star anise (if using), spices, and lemon juice in a large heavy-bottomed stockpot. All the ingredients ready to cook. 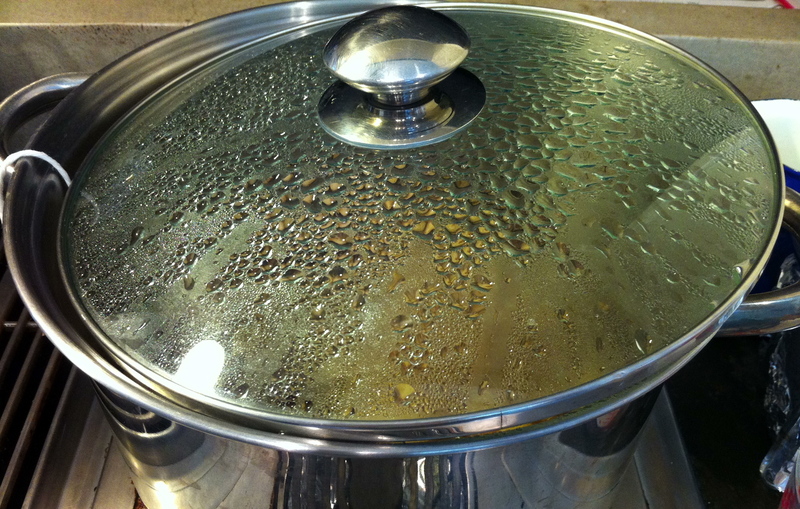 Cover the stock pot and bring the mixture to a simmer over medium heat. Stir occasionally. After 15 minutes. The apples are beginning to soften. After 30 minutes. The apples are beginning to break down. After 45 minutes. 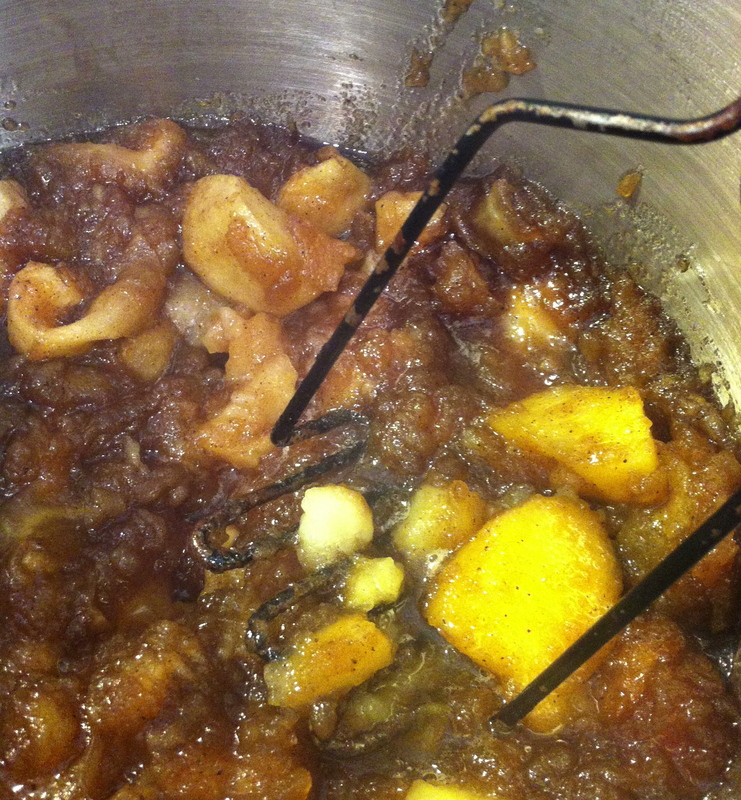 The apples are now soft enough to mash or puree. 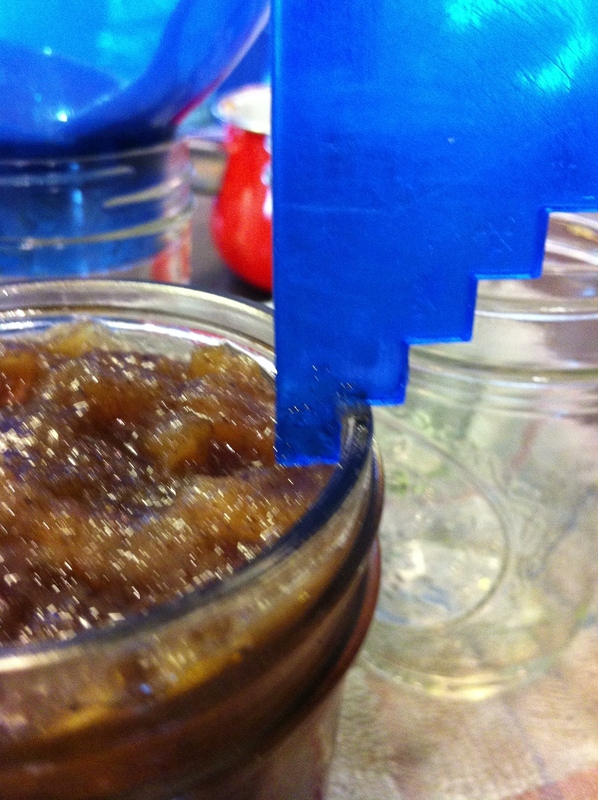 I prefer a little texture in my apple butter, so I use a potato masher on the apples. 3. Place the uncovered stockpot back on the heat. Turn the heat down to low. Cook for another 15 – 30 minutes, depending how thick a consistency you want. Stir frequently. 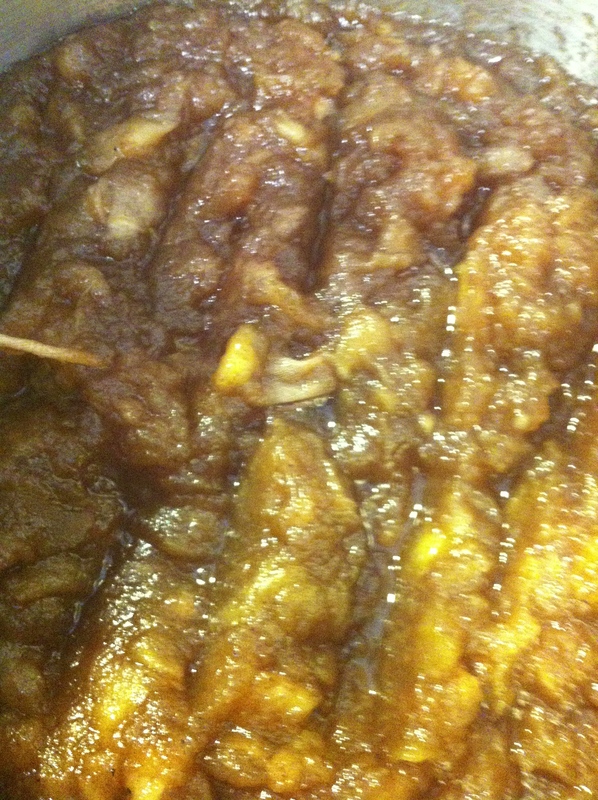 The finished apple butter. Close-up view. 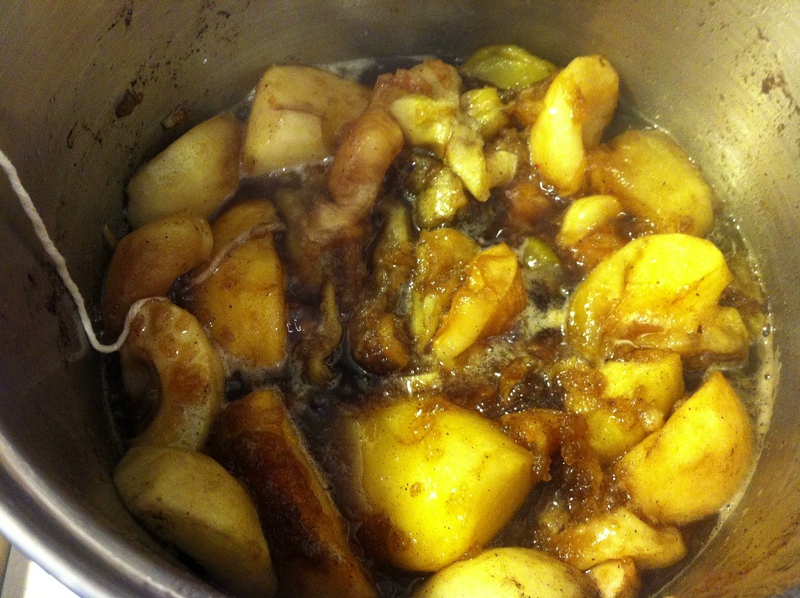 Pull out the packet of star anise and discard it. 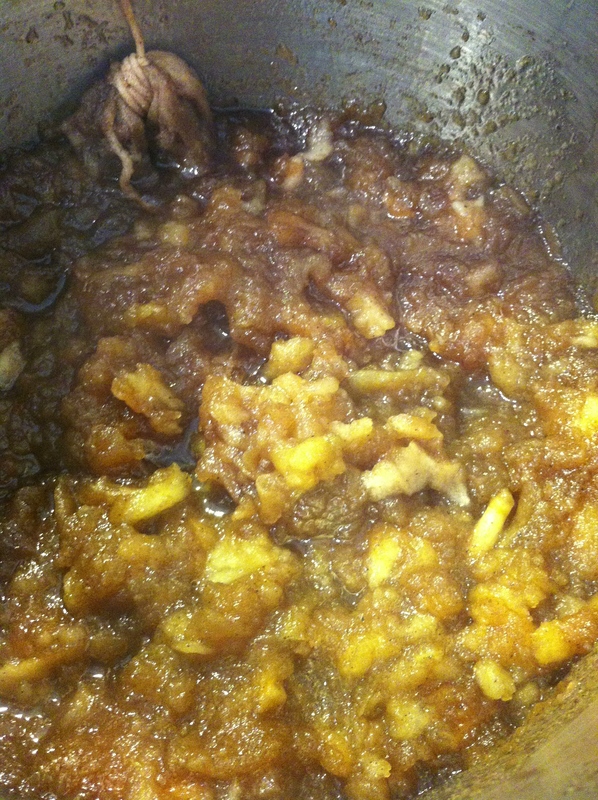 Ladling the apple butter into jars. Filling the jar to the correct level. Checking the headspace in the jar. It’s extremely important that this is correct. Check for and remove as many air bubbles as possible. Wiping the jar rims with a damp paper towel. Let the jars sit and cool. 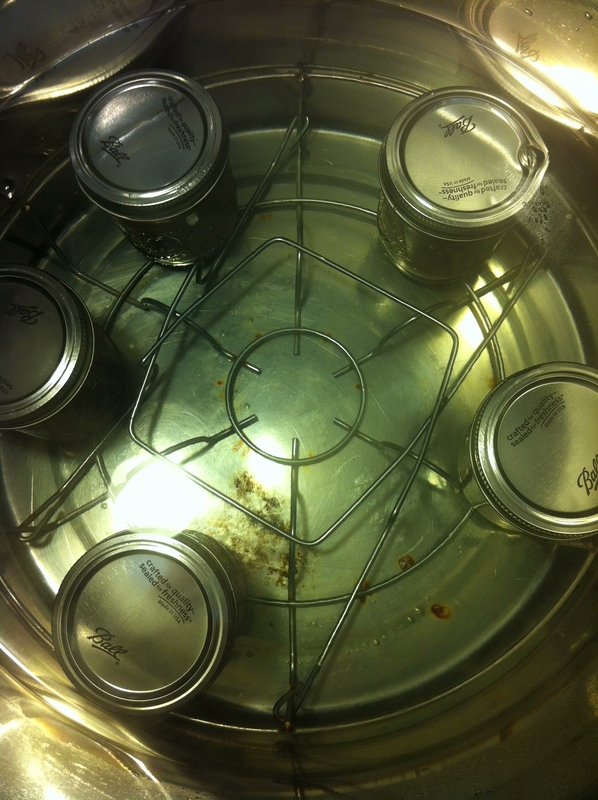 As the jars cool, the lids should seal. You’ll hear a “ping” sound as they begin to seal. This can take up to 24 hours. 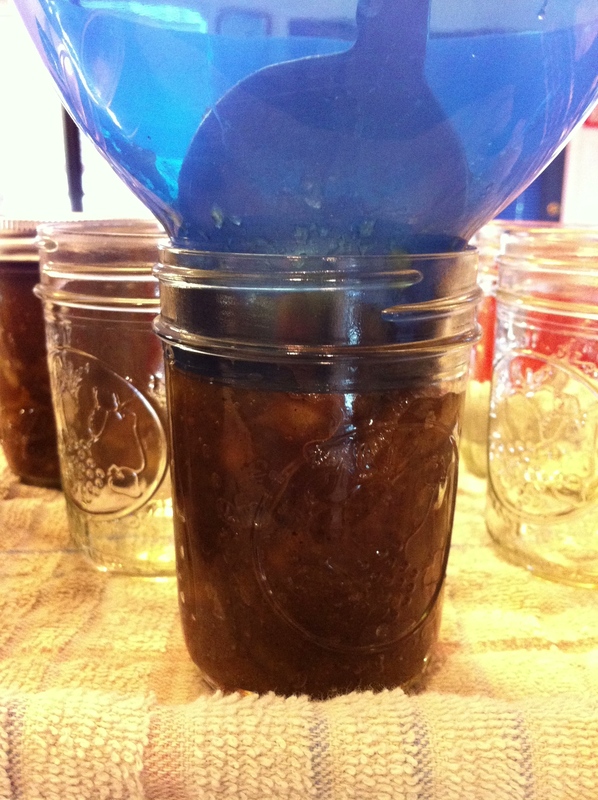 After the jars are sealed, you can tighten the rims. 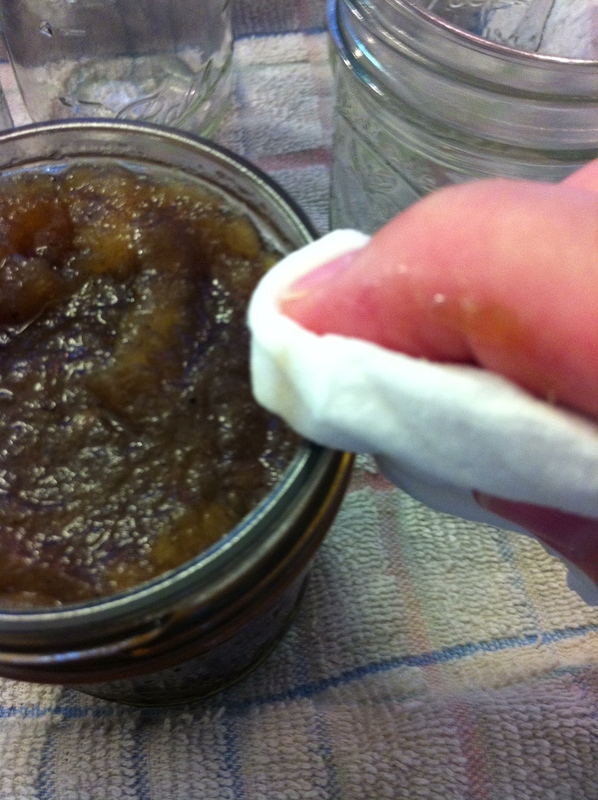 If you have a jar that doesn’t seal, refrigerate and eat the apple butter within 3 weeks. Be sure to label and date the jars. The apple butter keeps for a year, unopened (recommended). Once it’s opened, eat within 3 weeks. Yields 4 – 6 half pints.